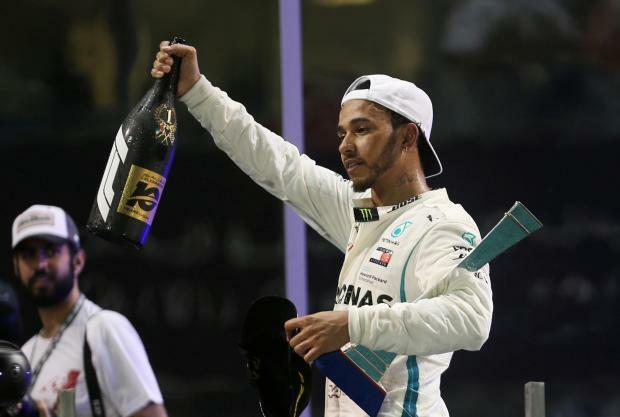 Five times world champion Lewis Hamilton signed off in style on the Formula One season on Sunday with victory in Abu Dhabi, his 11th win of the campaign, and a points record. Ferrari's Sebastian Vettel finished second with Red Bull's Max Verstappen third. "I am so happy right now," said Hamilton after Hollywood actor Will Smith brought down the chequered flag at the floodlit Yas Marina circuit on Hamilton's 73rd career win. The Briton, who has won 51 of the 100 races in the V6 turbo hybrid era, became the first driver to score more than 400 points in a season with a final tally of 408. His victory also left him 18 wins away from Michael Schumacher's all-time record. Two times world champion Fernando Alonso, in his farewell race with McLaren, had hoped to sign off in the points but finished 11th. With both championships already won, Hamilton taking his in Mexico with two races to spare and Mercedes sealing their fifth successive constructors' and drivers' double in Brazil, Sunday's focus was on the race and those moving on -- particularly Alonso. Hamilton, Vettel and the Spaniard -- three great champions -- spun their cars in a cloud of smoke at the end of their slowing down lap, before stepping out for hugs and words of mutual respect.